If you needed to start life over in a better place, Darby-on-the-Sea might not be your first choice. Minna has been on the road for days, though–alone, exhausted, and living intentionally blind. By now, she’ll take whatever help she can get, even if she doesn’t believe she deserves it. His footsteps across the boards gave Minna her only warning, for he took hold of her elbow and hauled her after him without so much as a by-your-leave. “My darling child, you might have been killed, standing in the street like that.” Still holding her by her arm, he directed them up the street toward his own house. The villagers in Darby have good reason to distrust strangers. With the rocky island off their coast home to monsters, it takes a special sort of hero to win their approval. Minna, anxious, shy, and obviously fleeing misfortune, just doesn’t fit the bill. Pinewood does. The offer of shelter and rest is too tempting for Minna to resist. Worst of all, Pinewood offers Minna a friendship like she has never had before. She knows, though, that one wrong look could bring it all down in flames. She knows what will happen if a hero finds out the truth about her. Her secret revealed, she waited in her self-imposed darkness—for the blow of a hatchet, or a hunter’s knife against her throat, or any of the thousand other deaths she imagined earned Pinewood their reputation and their keep within the village. 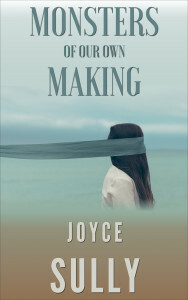 Monsters of Our Own Making, a story of losing everything and finding where you belong, now available for purchase in my shop for all ebook formats, on Amazon.com for Kindle, and on Barnes and Noble for NOOK.